Equipment for melt blowing resembles facilities for coating more than machines for plastics processing, though it includes such traditional units as extruders fitted with high precision spray heads which are manufactured by special methods comparable to jeweler’s art. That is why experiments connected with modification of precision elements of spray heads, receiving units, and other special equipment are highly expensive. 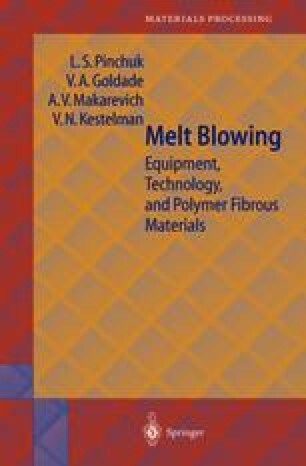 So, the developers of melt blowing equipment highly rate the experience accumulated by them and this is, probably, the main reason why there is a scarcity of publications reflecting melt blowing problems in the scientific literature. Every design described in this chapter is based on know-how without which highly productive and reliable operation of equipment is improbable.